The Stamp Act of 1765 (short title Duties in American Colonies Act 1765; 5 George III, c. 12) was an Act of the Parliament of Great Britain that imposed a direct tax on the colonies of British America and required that many printed materials in the colonies be produced on stamped paper produced in London, carrying an embossed revenue stamp. Printed materials included legal documents, magazines, playing cards, newspapers, and many other types of paper used throughout the colonies. Like previous taxes, the stamp tax had to be paid in valid British currency, not in colonial paper money. The purpose of the tax was to help pay for troops stationed in North America after the British victory in the Seven Years’ War and its North American theater of the French and Indian War. The Americans said that there was no military need for the soldiers because there were no foreign enemies on the continent, and the Americans had always protected themselves against Indians. They suggested that it was actually a matter of British patronage to surplus British officers and career soldiers who should be paid by London. The Stamp Act was very unpopular among colonists. A consensus considered it a violation of their rights as Englishmen to be taxed without their consent—consent that only the colonial legislatures could grant. Their slogan was “No taxation without representation.” Colonial assemblies sent petitions and protests. 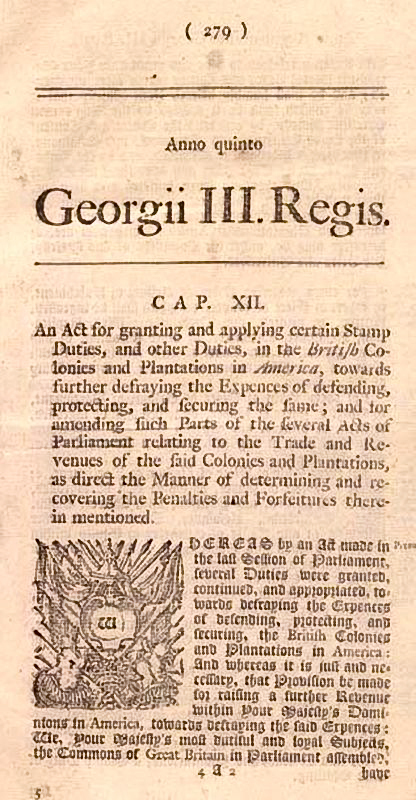 The Stamp Act Congress held in New York City was the first significant joint colonial response to any British measure; it petitioned Parliament and the King. Local protest groups led by colonial merchants and landowners established connections through Committees of Correspondence, creating a loose coalition that extended from New England to Maryland. Protests and demonstrations initiated by a new secret organization called the Sons of Liberty often turned violent and destructive as the masses became involved. Very soon, all stamp tax distributors were intimidated into resigning their commissions, and the tax was never effectively collected. Opposition to the Stamp Act was not limited to the colonies. British merchants and manufacturers, whose exports to the colonies were threatened by colonial boycotts, pressured Parliament. The Act was repealed on March 18, 1766 as a matter of expedience, but Parliament affirmed its power to legislate for the colonies “in all cases whatsoever” by also passing the Declaratory Act. There followed a series of new taxes and regulations, likewise opposed by the colonists.